Home / More / Library / List of Medicinal Plants / Usnea spp. Earth Medicine Special Report: Usnea from David Bruce Leonard on Vimeo. COMMON NAMES: ‘Umi koa (“beard of koa”), limu ‘o ke kuahiwi (“seaweed of the mountain”) [Hawai’i]; song lo [China]; old man’s beard [USA]; chan wiziye (“spirit of the north wind”) [Lakota]; janggut tok adam (“adam’s beard”), rumput angin (“air grass”), tahi angin (“excrement of air”) [Malaysia]. CATEGORY: Cool herbs that transform hot phlegm. PREPARATION OF MEDICINE: Because usnic acid is not water soluble, the tincture is preferred (1:3, 70% alcohol), or you can decoct. A crock pot works well. Usnea can also be made into a salve. WESTERN FUNCTIONS REPORTED: Antibacterial; antibiotic; antifungal; antiparasitic; antiseptic; as bitters; dermatological aid; eupeptic; general wound healer. Opens the chest~, cleanses the lungs, transforms phlegm~. Clears deficiency heat~, stops bleeding. 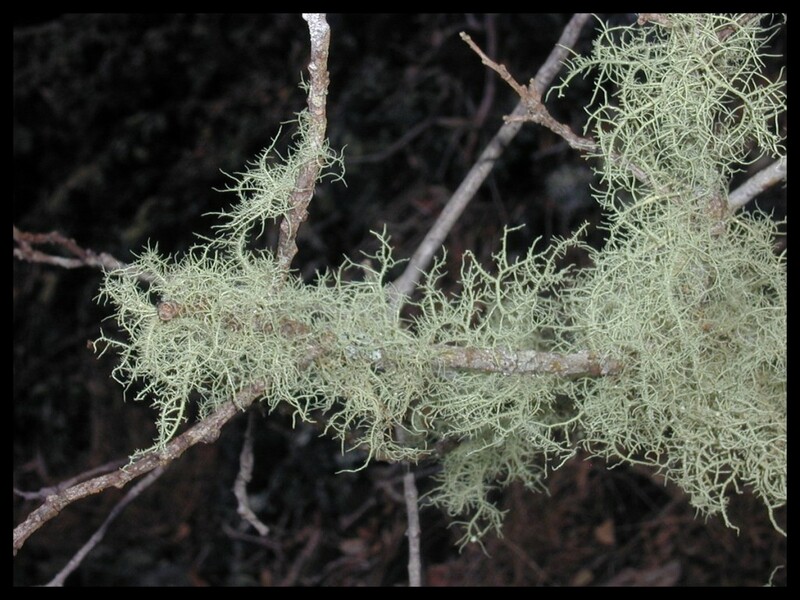 Usnea is not actually a plant but a lichen, which is part algae and part fungus. A good way to identify this lichen is to pull it apart. Medicinal Usnea has a soft thread-like “core” and is always round. Most of the research points to usnic acid being an effective antibacterial against gram-positive bacteria; [Cocchietto 2002; Garcia, 1999], although one study showed it to be also antibacterial against gram-negative bacteria [Rowe 1989]. Its effect on gram-positive bacteria may be due to secondary metabolites of lichens [Lauterwein 1995]. Usnic acid may prevent bio-film colonization by Staphylococcus aureus, Enterococcus faecalis, and Enterococcus faecium on artificial implant devices [Francolini 2004]. An usnic acid preparation can inhibit Streptococcus mutans in the oral cavity without altering the normal bacterial equilibrium of the mouth [Ghione 1988]. Usnic acid inhibits Epstein-Barr virus activation [Yamamoto 1995] and is a potent inhibitor of mouse polyomavirus because of its ability to inhibit RNA transcription [Campanella 2002]. Extracts of Usnea complanta are antiviral in vitro against Herpes simplex virus [Vijayan 2004].Usnic acid is used topically with zinc sulfate to prevent post-surgical recurrence of Human Papilloma virus [Scirpa 1999]. Usnic acid is anti-parasitic against Leishmania amazonensis when applied intra-lesionally but not orally or subcutaneously in mice [Fournet 1997]. It has a strong effect against Trichomonas vaginalis in vitro [Wu 1995]. Some research points to Usnea spp. extracts being only mildly antineoplastic [Proska 1999], while others report stronger effects [Bezivin 2004; Campanella 2002]. Extracts of U. fasciata containing the polysaccharide raffinose inhibited close to 90% of sarcoma 180 and Ehrlich tumor cells [Periera 1994]. Usnic acid is anti-inflammatory in lab animals for both acute and chronic conditions [Vijayakumar 2000]. It is analgesic and reduces induced fever in mice [Okuyama 1995]. TOXICITY: None noted when using the whole lichen. CAUTIONS AND CONTRAINDICATIONS: Not in pregnancy. May cause contact dermatitis in topical use, discontinue if rash develops [Mitchell 1965; Goncalo 1987]. If used in autoimmune conditions, monitor immune status carefully. In Native American traditions Usnea represents the north and maintains the “lungs” of Planet Earth. In those traditions Usnea has a sacred primeval relationship with the trees, helping to protect them against infections. One of our best plants for chronic respiratory problems. Because it does well as a tincture, it is often taken separately from the rest of an herbal formula.